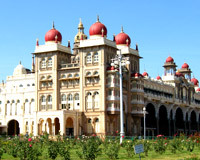 Mysore, also known as the City of Palaces, is the second largest city in the state of Karnataka, India. It is situated at the base of the Chamundi Hills and lies about 140 km away from Bangalore. It is also the headquarters of the Mysore district and the Mysore division. Steeped in tradition, Mysore is located at the epicentre of the Indian history, culture, and timeless elegance. It is a popular tourist destination and offers several attractions ranging from the royal splendour of Mysore City and its fabulous Dussehra Festival to exquisite temples, pilgrimage centres and scenic spots. The word Mysore expands to "Mahishasurana Ooru" which means the town of Mahishasura, a demon from the Hindu mythology. According to the legend, this demon Mahishasura was killed by goddess Chamundeshwari atop the Chamundi hill near Mysore. Initially Mysore was ruled by the Wodeyar family except for a brief period in the late 18th century when Haidar Ali and Tipu Sultan took power. This former state capital today presents a seamless blend of rich heritage, old-world charm and modernity. The charisma of this city leaves no one untouched. There are several tourist attractions in Mysore. The most popular are the Mysore Palace which was constructed between 1897-1912 in Indo-Saracenic style, and St. Philomena's Church that was built in Gothic style and is among the largest in India. The Chamundeshwari Temple situated atop the Chamundi Hill is one of the noted Hindu places of worship. Other important places to see are the Nandi Bull Temple on the Chamundi Hills, Mysore Zoo and the Rail Museum. While tourism is the major industry in Mysore, the growth of information technology related industry in the first decade of the 21st century has resulted in the city emerging as the second largest software exporter in the state of Karnataka, next to Bangalore. Mysore is also well-known for artifacts made out of sandalwood, rosewood and teakwood. The shimmering silks, traditional paintings and perfumes of Mysore figure prominently in the shopping lists. Mysore is famous for its "Agarbathies" or incense sticks and the best place to get these items is the Government Handicrafts emporium in Mysore. During the month of October and November, the Dussehra festival is celebrated for ten days and the city is at its colourful best with music, dance, sports competitions, fairs and exhibitions all over. In short, Mysore is a burgeoning city in terms of technology and trade and presents an inviting and a charming appeal to all the tourists across the globe.